From the ninth to fifteenth century AD, the Khmer empire located in present-day Cambodia was one of the greatest powers in Southeast Asia, and the vast city of Angkor was the seat of the power. The kings who ruled over the empire constructed large numbers of temples in the city as befitting of its status. The empire and the city gradually declined, but today it is the number one tourist draw in Cambodia. 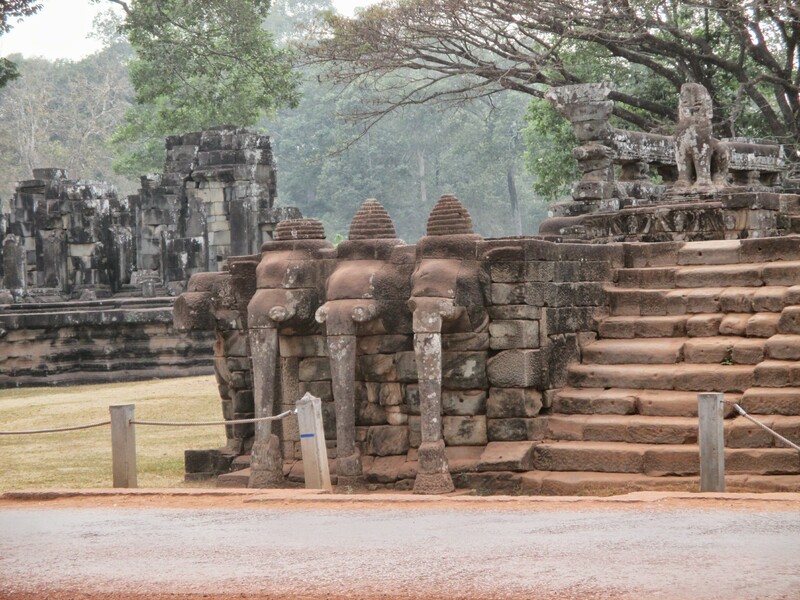 We spent three full days visiting the temples with the city of Siem Reap as our base. To get from Battambang to Siem Reap, we consulted the excellent site Move to Cambodia and chose the cheap local bus. The roads were a little better than we were expecting and we ended up arriving earlier than anticipated. The one hiccup along the way was at a rest stop. The bus paused in one town for a break, and Eric got off the bus to use the restroom while Della remained on with our stuff. As soon as Eric went into the toilet, the bus drove away! Della yelled at the driver to stop, but he just laughed and assured her that the bus would return in about ten minutes, which turned out to be true. So it worked out fine but at the time we were pretty worried! 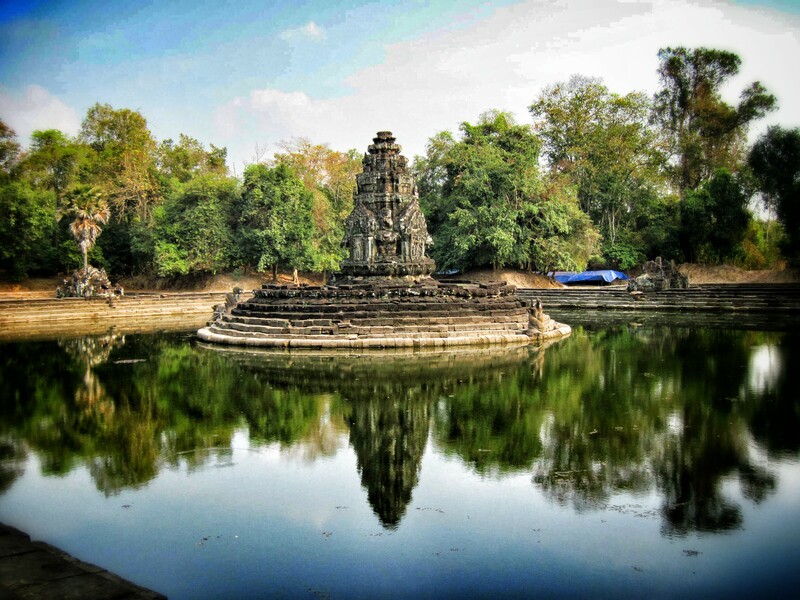 Siem Reap is a large city and is definitely geared to tourists visiting Angkor. We knew we wanted to stay four nights, but only booked two nights at Panda Guesthouse at first because its rate for the last of the nights was double of the other nights. On arrival, we asked about this and found out that this was because of Chinese New Year. They were already booked up anyway, so we had to find alternate accommodations. It wasn’t as hard as we were expecting, and we found an equivalent room at Top Sky Hostel for the last two nights. Both rooms had AC and ensuite bathrooms, which was nice after a long day of temple exploring. We knew we wanted to see the temples of Angkor, but then we were faced with the question of what exactly we wanted to see in our three days. Did we want to just hit the highlights, or see as many as possible? And in what order should we see them: see the best first or save them for last? And which modes of transportation should we use to see them? After lots of soul-searching and Internet research, we settled on what we think was a decent plan. We decided to leave the highlights for later, so on the first day we booked a tuk-tuk tour of some attractions that are outside the main park area. The first stop was actually not a temple but rather a museum. The Cambodian Landmine Museum is a small building that tells the story of a former child soldier who then dedicated his life to defusing the many bits of unexploded ordinance (UXO) left in Cambodia from the wars. The museum did a good job providing background on the wars and explaining more about how mines (the most problematic item of UXO left in Cambodia) work. We then shifted our focus back to the distant past and rode to the parking lot for the hike up to Kbal Spaen, also known as “The River of 1000 Lingas.” We hiked 2 km up a hill through the jungle to find the small riverbed with many Hindu images carved into it. Further down the stream was a section with hundreds of bumps, which are the aforementioned lingas – a phallic symbol representing the Hindu god Shiva and emphasizing male fertility. Our last stop was our first Angkor-era temple: Banteay Srei. This temple is known for its intricate carvings and it certainly didn’t disappoint. It isn’t as large as most of the other temples, so our visit didn’t take as long as it did at others. Della is holding the top of the temple! There are two traditional routes to see the main temples of Angkor: the Small Circuit which takes in those closest to Siem Reap, and the Grand Cirtcuit which goes to some just a little further (but not as far as Banteay Srei). We devoted our second day to visiting most of the temples on the Grand Circuit. It isn’t so far outside of town, but with the heat we thought visiting on bicycles might be tiring, but on the other hand we wanted to have some freedom for our own pace. Then we saw an ad for e-bikes and thought it would be perfect, especially after using them with great success in Bagan. For some reason, they seem to be much less popular for visiting Angkor, and there is only one outfit renting them: Green e-bike. The process was much more professional than in Bagan (paperwork, safety demonstration, etc.) but that also meant it was pricier. We started the Grand Circuit at Banteay Kdei, This was our first of the many Buddhist temples built Jayavarman VII in the 12th century. When we visited this large complex, we recall that we were pretty impressed, but honestly after we saw later temples we have a hard time remembering anything in particular about this one. We then slightly modified the official circuit and went to Ta Prohm, which is better known as the “Tomb Raider temple” due to its appearance in that movie. It is also known as one of the best places to see trees sprouting out through the ancient walls. Both of these factors meant that this was one of the busiest temples we visited, but the complex is big enough that we were still able to find some places of relative isolation to get good pictures. After a break for lunch, we started riding the Grand Circuit loop counterclockwise and then stopped at Pre-Rup. This temple was a big contrast from the first two we saw this day: whereas they were covered a large footprint with multiple small buildings, this one was built in the “temple mountain” style and was one large building. In some ways it reminded us of the Mayan ruins we saw in Belize and at Tikal. We passed by a few more and then visited Preah Neak Poan. This one was interesting because it felt more like an elegant fountain than a temple. Most of the area was blocked off, so there wasn’t much exploring to be done and this one was a quick visit. Our last stop was Preah Khan, which is another sprawling complex built by Jayavarman VII like Banteay Kdei and Ta Prohm. So, in some ways it felt pretty similar, but as it was closer to the end of the day the different lighting made for some good pictures. Also, we entered through the eastern entrance, which is not the one used by the large groups, so we were able to feel like we almost had the place to ourselves at times. We tried to explore some side passages but actually ended up outside the temple at one point because so many areas were blocked off with rubble. On our ride back to Siem Reap as the sun set, we were able to get a bit of a preview for what we would see the next day, since the fastest way back took us through the large Angkor Thom complex and the famous Angkor Wat. We paused just outside the South Gate of Angkor Thom and got some nice sunset pictures. One benefit of the e-bike service is that the rental period is for 24 hours, so rather than returning them we took them back to our hostel to use the next morning. We could even remove the batteries and change them in our room overnight. One of the classic Angkor experiences is supposed to be watching the sun rise over Angkor Wat. We went back and forth about whether we wanted to do this. We are definitely not morning people and we wandered how crowded it would be. Ultimately though, we decided to do it, especially since we had our e-bikes to zip out there with. Our timing was a little off, so by the time we were walking through the gates of the Angkor Wat complex the sunrise colors had already appeared. We hustled to the “best” spot for viewing – near the reflecting pool by the NW corner (where of course there were tons of other people). The colors were somewhat decent, but we both were thinking that this would go down as an overhyped attraction. Then, just as we had given up, the sun itself appeared behind the towers of Angkor Wat. The colors that this produced were worth waking up for! The reflecting pool was definitely a good tool to use to get a nice picture, so we found some spots where we could frame pictures without the other hundred tourists in it. After the sun rose more, we headed in to visit Angkor Wat itself since the temperatures were cool and the big crowds supposedly have gone back into town to eat breakfast. We certainly weren’t the only ones with this strategy, but it did seem like a relatively calm time to visit. We used the Lonely Planet to guide us through the carvings on the bottom level, and ascended to the top level for excellent views over the complex. It was then time to return our e-bikes, so we rode back into town. We then took a long afternoon lunch break and siesta to avoid the heat. At 3, we rented bicycles from our hostel and headed back towards Angkor Thom. Transportation trilogy complete! The bikes were pretty low quality – Eric’s sounded like it would fall apart at any moment – but the roads are flat so the ride wasn’t too bad. We hadn’t left ourselves enough time to see all of the massive Angkor Thom complex (this was Jayavarman VII’s royal city), so instead we just decided to focus on its main temple at the center, Bayon. This temple is most well known for the multitude of towers with semi-smiling faces pointing at the four cardinal directions. Different guides have different theories for who the faces represent: a Bodhisattva, Buddha, or maybe even Jayavarman VII himself. We climbed up to the top level and scrutinized these faces up close, but still haven’t decided which theory we believe. The sun was beginning to set, so we didn’t have time for anything else, but we did take a quick run up to see the Terrace of the Elephants. Our ride back was a little stressful with a decent amount of traffic, but we made it back in one piece. Ultimately, we are pretty proud of how many different sights we saw, and think that our itinerary worked well for what we wanted to see and do. In the Angkor Trade Center (a small mall), there is a little place where you can rent out your own private movie screening room. We got a room one night and watched Gone Girl (since we both had read the book). We got our own large screen with a big couch for $5 a person. It was a fun and unique way to watch a movie! 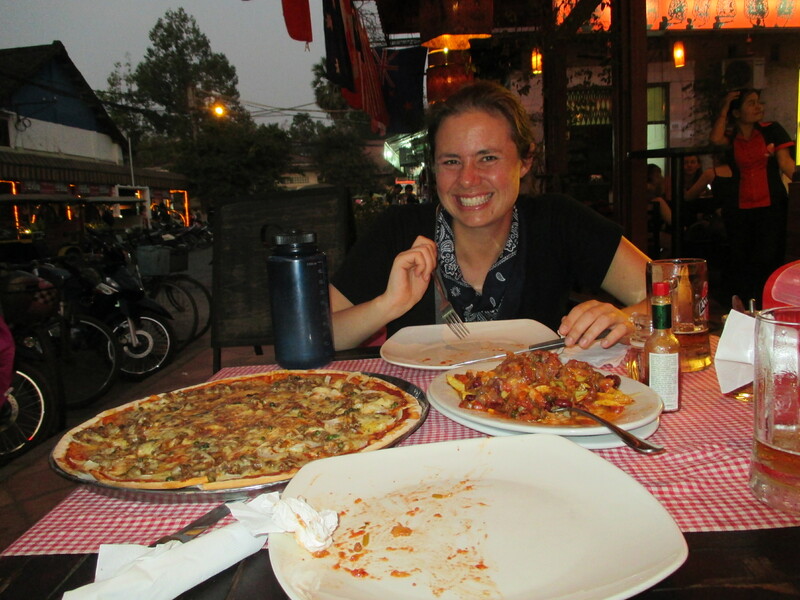 Siem Reap caters to a huge number of tourists, so it is not hard to find a place to eat. 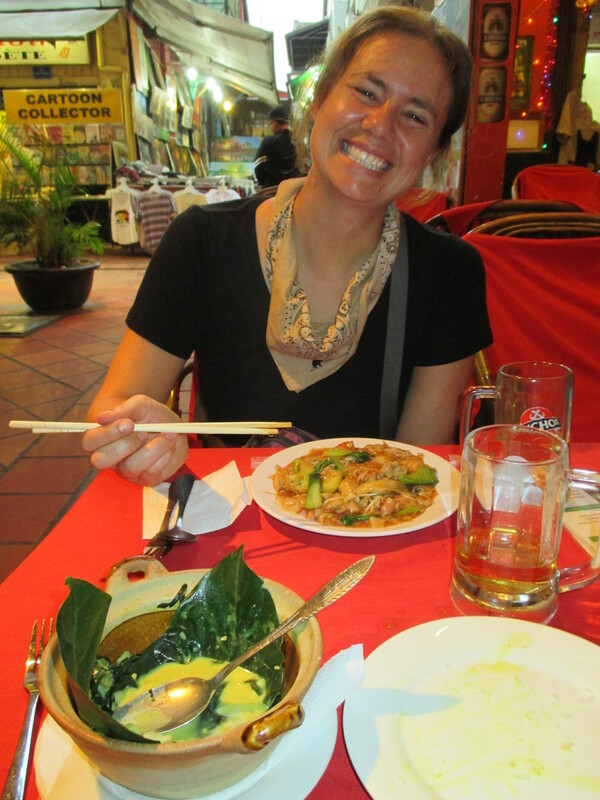 One night we ate at a generic restaurant called Angkor Famous where we were able to get a curry (a special Khmer curry called amok) and noodles for $3 each. We also discovered that happy hour beers were only $0.50 here! Two other nights we decided to go Western. One of them we got pizza at Belmiro’s, although we got it Khmer-style with lok lak beef and fancy Kampot peppercorns (a tad overwhelming, to be honest). The other night we got burgers at a nearby guesthouse. The Top Sky had a kitchen, and we ended up eating two meals here out of convenience / temple fatigue. One of the standout dishes here was a Khmer soup that was pretty simple but had a nice fish broth. This is crazy! Brad and I are in Siem Reap right now and we’re staying at Panda! Possibly in the same exact room you posted the picture of! Small world, eh? Hope the rest of the journey is going well. I love following the blog. I love your enthusiasm!